Please see the previous article at http://ponnadi.blogspot.in/2014/06/virodhi-pariharangal-25.html. 58. ukthi virOdhi (உக்தி விரோதி) - Obstacles in our speech/language. ukthi means word, language, way of speaking, etc. It is emphasised in this section that srIvaishNavas should be well aware of the most dignified srIvaishNava paribhAshai (special choice of words, etc - for detailed listing, please refer to http://srivaishnavagranthams.wordpress.com/readers-guide/) and speak that only and also avoid speaking like common materialistic people. This is a lengthy section. Yet, it is very much essential and should also be practically followed in daily life. Translator's note: srIvaishNavas have traditionally used a wide selection of wonderful words/phrases for common terms. Majority of this section deals with thamizh words, but same principle could be applied in other languages too. In any language, the same action could be explained in multiple terms. Being a srIvaishNava, it is recommended that we use dignified words and speech. This section is lengthy and little bit more technical with lots of thamizh terms. Let us see this section now. When a srIvaishNava calls us, we should respond "adiyEn" (அடியேன் - "dhAsan" with humility) and when materialistic person calls us, we should respond "En" (ஏன் - what, why you called). Doing the reverse is an obstacle. Also, if we respond incorrectly by mistake or due to carelessness, we should feel sorry and atone for that immediately. Not doing so is an obstacle. Translator's note: In important aspect to note in any mistake. Whenever we atone (feel sorry, etc) for a mistake - if we truly realize the mistake, we should never repeat the same mistake again. When speaking to srIvaishNavas, not using dignified terms like "viNNappam aruLichcheytharuLa" (விண்ணப்பம் அருளிச்செய்தருள - kindly recite), "thirukkai viLakkiyaruLa" (திருக்கை விளக்கியருள - kindly wash your hands), "churuLamuthu amudhucheytharuLa" (சுருளமுது அமுதுசெய்தருள - kindly accept this betel leaves and nuts), "kaNvaLarntharuLa" (கண்வளர்ந்தருள - kindly sleep) is an obstacle. In srIvaishNava paribhAshai "aruLa" (அருள - bless us), "amudhu" (அமுது - nectarean food - prasAdham) and "thiru" (திரு - honorable/reverence) are more commonly used to add dignity and reverence towards the other person whom we are discussing with. These are called "pujyOkthi" - words of glorification. These are also called as prapannOkthi (language of prapannas). In the next point, the words which are commonly used by materialistic people and is explained that prapannas should not use such words. First, in this point, the proper terminology is explained and then in the next point, the terminology that is to be avoided is explained. When saying "viNNappam aruLichcheytharuLa" to srIvaishNavas, it means, requesting the leading adhyApaka swamy to start the recital. In temple sannidhis, during dhivya prabhandha gOshti, the leading adhyApaka will request others to recite along by saying "sAdhiththaruLa" (ஸாதித்தருள) and start reciting the thaniyans. Others will follow along and recite. During special occasions (in some sannidhis always), the archaka or maNiyakArar (administrator) will say "aruLappAdu sAdhu srIvaishNavargaL" (அருளப்பாடு ஸாது ஸ்ரீவைஷ்ணவர்கள்), or "aruLappAdu rAmAnusanadiyArgaL" (அருளப்பாடு ராமாநுசனடியார்கள்) or "aruLappAdu thiruvAimozhi viNNappam cheyvAr" (அருளப்பாடு திருவாய்மொழி விண்ணப்பம் செய்வார்). The leader of the gOshti (and others too) will say "nAyanRE nAyanRE" (நாயன்றே நாயன்றே) this dog is here to serve - AzhwArs themselves call themselves as dogs indicating that they are loyal servant of bhagavAn who is the master) and then starts reciting. This is commonly seen in many places. Similarly, such dignified words should be used with great humility when dealing with srIvaishNavas. When speaking to materialistic people, using dignified words instead of saying "vArththai chollu" (வார்த்தை சொல்லு - speak), "iru" (இரு - wait/be seated), "eNNeyidu" (எண்ணெயிடு - apply/give oil), "uRangu" (உறங்கு - sleep), etc., is an obstacle. We dont need to and should not be using srIvaishNava paribhAshai when speaking to materialistic people who would probably not understand such terms anyway. Not knowing the following terms properly and using them without knowing their value are obstactles - the terms are: thIrthamAda (தீர்த்தமாட - to take bath), prasAdhappada (ப்ரஸாதப்பட - to accept prasAdham - to eat), amudhupadi (அமுதுபடி - rice), kaRiyamuthu (கறியமுது - vegetables), adisil/thirukkaNNamuthu (அடிசில்/திருக்கண்ணமுது - pAyAsam - sweet rice), prasAdham (ப்ரஸாதம் - remnants of bhagavAn/bhAgavathas), thIrtham (தீர்த்தம் - sanctified water), thirumanjanam (திருமஞ்சனம் - water to be used in perumAL's thiruvArAdhanam, this term is also used to say "bathing of emperumAn"), ilaipprasAdham/ilaiyamudhu (இலைப்ப்ரஸாதம்/இலையமுது - prasAdham served in plantain leaf), mUnRAvathu (மூன்றாவது - lime paste which is used as the third component along with betel leaves, nuts). Using commoner's terms like kuLikka (குளிக்க - to bath), uNNa/thinna (உண்ண/தின்ன - to eat), arisi (அரிசி - rice), chORu (சோறு - cooked rice), kaRi (கறி - vegetables), thaNNIr (தண்ணீர் - water), veRRilai (வெற்றிலை - betel leaves), suNNAmbu (சுண்ணாம்பு - lime paste) is an obstacle. Using the following dignified terms for the dhEvathAntharams who are known as thiruvillAth thEvar (திருவில்லாத் தேவர் - all anya dhEvathAs who lack thiru - srI mahAlakshmi sambandham) is an obstacle. The terms are: thiruppathi (திருப்பதி - dhivya dhEsam where emperumAn stays happily out of own desire, can also mean thirumalA thiruppathi), thiruchchOlai (திருச்சோலை - divine garden, can also mean thirumAlirunchOlai), thirup poygai (திருப் பொய்கை - divine pond), thirukkOpuram (திருக்கோபுரம் - divine temple tower), thirumadhiL (திருமதிள் - divine fort around the temple), thiruvIdhi (திருவீதி - divine streets around the temple), thirumALigai (திருமாளிகை - residence of AchAryas/srIvaishNavas), thiruvAsal (திருவாசல் - divine main entrance), thirumaNdapam (திருமண்டபம் - divine hall), thiruchchuRRu (திருச்சுற்று - inner layer around the sannidhi), thiruvOlakkam (திருவோலக்கம் - divine assembly), thiruppaLLiyaRai (திருப்பள்ளியறை - divine sannidhi of perumAL), thiruppaLLik kattil (திருப்பள்ளிக் கட்டில் - simhAsanam - throne or bed), thirumERkattu (திருமேற்கட்டு - vidhAnam - decorative cloth tied in the roof), thiruththirai (திருத்திரை - divine screen), thirukkoRRoliyal (திருக்கொற்றொலியல் - divine cloth for covering prasAdham container, etc), thiruveN chAmaram (திருவெண் சாமரம் - divine wisk), thiruvAlavattam (திருவாலவட்டம் - fan), thiruvadi nilai (திருவடி நிலை - lotus feet/sandals), thiruppadikam (vessel where thiruvArAdhana thIrtham is collected), thirumanjanakkudam (திருமஞ்சனக்குடம் - pot to bring water for thirumanjanam/thiruvArAdhanam), thirupparikaram (திருப்பரிகரம் - paraphernelia), thiruvandhik kAppu (திருவந்திக் காப்பு - hArathi done at the end of puRappAdu/procession), thiruviLakku (திருவிளக்கு - divine lamp), thirumAlai (திருமாலை - divine garland), thiruvAbaraNam (திருவாபரணம் - divine ornaments), thiruppaLLith thAmam (திருப்பள்ளித் தாமம் - thuLasi beads garland), thirumEni (திருமேனி - divine form from head to toe), thirunAL (திருநாள் - festival), etc. Translator's note: In any word, when used for bhagavAn, AzhwArs, AchAryas, and srIvaishNavas, we should always use "thiru" as a prefix. By doing that we show our reverence towards the one who is dealing with us. But such glorification should not be done for other dhEvathas who are devoid of the direct connection of srI mahAlakshmi. thirumazhisai AzhwAr says in nAnmugan thiruvanthAdhi "thiruvillAth thEvarai thEREnmin dhEvu" (திருவில்லாத் தேவரை தேறேன்மின் தேவு - I will not treat such dhEvathas who lack connection with mahAlakshmi as dhEvatha ever). Being a srIvaishNava saying "srIrangam" instead of "kOyil", not saying "thiruvarangam" after sneezing and saying other dhivya dhEsam's names, saying "vEnkatam" for thirumalai instead of saying "thiruvEnkatam", saying "kAnchIpuram" instead of "perumAL kOyil", saying "anantha sayanam" instead of "thiruvananthapuram" are obstacles. Here, ideal terminologies for dhivya dhEsams are emphasised. In srIvaishNava sampradhAyam "kOyil" (temple) means it indicates srIrangam naturally. Similarly "thirumalai" means thiruvEnkatam and "perumAL kOyil" means "kAnchIpuram". And then there is thirunArAyaNapuram (mElkOte) - these four are of great significance to srIvaishNavas. srIvaishNavas should use sampradhAyam terms instead of commoner's terms. One should be aware of such terminologies and use them properly. Also, when we sneeze, it is common to utter some auspicious names. In this case, it is said that we should only utter "thiruvarangam". Translator's note: Once when bhattar was lecturing, a srIvaishNava in the gOshti sneezes and says "vEnkatam". bhattar becomes very angry and says "you should only say thiruvarangam". The srIvaishNava quietly agrees. But he is from thirumalA thiruppathi - so he goes back and discusses this with ananthAzhwAn in thirumalA. ananthAzhwAn gives him an idea and sends him back to bhattar. He again attends the lecture and sneezes again. He says "vEnkatam" again - bhattar notices and tells him "I have already told you to say thiruvarangam - why are you repeating this mistake again?". 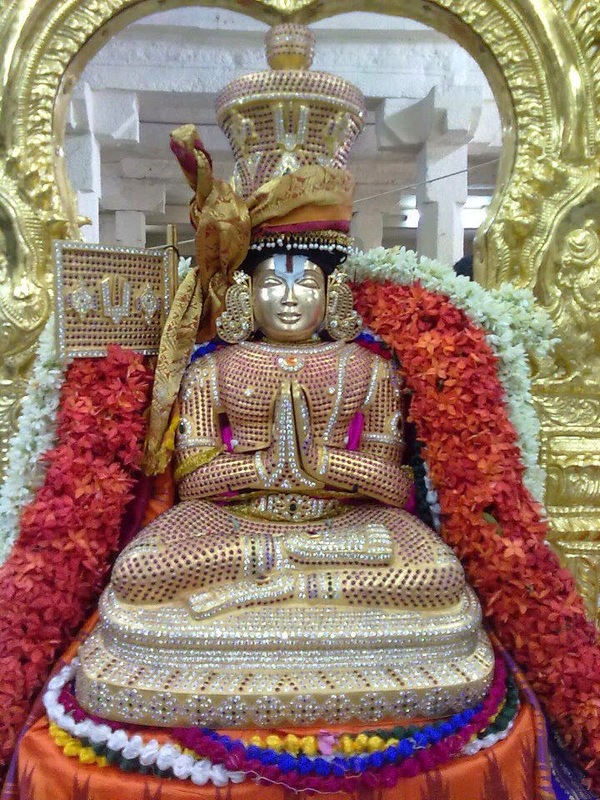 The srIvaishNava replies "thirumangai AzhwAr himself said vEnkatamE in veRuvAthAL pAsuram (periya thirumozhi 5.5.1) which is meant from srIranganAthan". bhattar, who is most intelligent replies to him saying "Look, that is not AzhwAr saying, it is AzhwAr singing in parakAla nAyaki's mother's mood - if it was parakAla nAyaki (AzhwAr in feminine mood), she would have only said thiruvarangam there too". The srIvaishNava becomes convinced then with bhattar's explanation. Starting at this point, srI rAmayaNa and other purANa purushas' names are explained from sampradhAyam perspective. Each of these personalities have specific names which glorify some aspect of them. It is recommended that we use such names instead of the common name for them. Generally srI rAmAyaNa is hailed as divine sAsthram which exemplifies the aspect of bhakthi in various ways. Saying "srI rAma" instead of "perumAL", saying "sIthA" instead of nAchiyAr (or pirAtti), saying "lakshmaNan" instead of "iLaya perumAL", saying "srI krishNa" instead of "krishNa" (since krishNa wanted to be treated like cow-herd boy he does not like to be treated with reverence but likes to be treated like a friend), saying "srI nrsimhan" instead of "azhagiya singar" (beautiful lion faced) - thirumazhisai AzhwAr says in nAnmugan thiruvanthAdhi - "azhagiyAn thAnE ariyuruvan thAnE" (the lion faced emperumAn is most beautiful, Translator's note: In vishNu sahasranAmam also it is said that "nArasimha vapu srImAn" - the most beautiful lion faced emperumAn), saying "guhan" instead of "srI guha perumAL" (since guhan was accepted by srI rAma as his own brother, he too becomes to be called guha perumAL), saying "hanumAn" instead of "thiruvadi", saying "sugrIvan" instead of "mahArAjar", saying "jatAyu" instead of "periya udaiyAr", saying "thuLasi" instead of "thiru thuzhAi" (as AzhwArs used the word "thuzhAi" in many places) are obstacles. AzhwAn/AzhwAr term is suffixed for great devotees of emperumAn such as srI vibhIshaNAzhwAn, srI gajEndhrAzhwAn, thiruvAzhiyAzhwAn (sudhasana chakram), srI pAnchajanyAzhwAn (sangam - conch), srI bharathAzhwAn, srI sathrugnAzhwAn, kOyilAzhwAr (bhagavAn's sannidhi), nammAzhwAr (srI satakOpan). Not doing so is an obstacle. We can also observe that periyavAchAn piLLai calls gaNtA karNan who is a corpse eating demon as "srI gaNtAkarNAzhwAn" due to his unflinching devotion towards krishNa. Translator's note: AzhwAn/AzhwAr generally means one who is immersed in bhagavath anubhavam (auspicious emotions). It is used for certain personalities to highlight their attachment towards bhagavAn. Many AchAryas are glorified with the title AzhwAn - kUrathAzhwAn, engaLAzhwAn, nadAthUrAzhwAn, miLagAzhwAn are a few who are given such title due to their overwhelming attachment towards emperumAn. Saying "sALagrAmam" instead of "thIrtha nAyanAr" is an obstacle. In kaNtaki river, which is near the dhivya dhEsam named sALagrAmam, bhagavAn appears in deity form (as stone deities). Such deities are commonly called as "sALagrAmam". But this is not correct (in srIvaishNava terms). He should be called thIrtha nAyanAr (as he appears from thIrtham - water). He is also called as "srI mUrthy". Translator's note: sALagrAma sILAs are most auspicious. emperumAn appears in deity form out of great compassion so that any one can place him at their homes and worship them with minimum requirements. thIrtha also means pure/sacred/holy - emperumAn's divine form of "srI mUrthy" is most sacred and pure - that is also another reason he is called thIrtha nAyanAr. nAyanAr means "lord" or "most respected". srImath dhvArapathi nAyanAr (ஸ்ரீமத் த்வாரபதி நாயனார்)- The name for the main gate keepers of emperumAn's temple, etc. thiruvAsal kAkkum mudhaligaL (திருவாசல் காக்கும் முதலிகள்) - These are the door-keepers inside the temple (just outside the sannidhi). In thiruppAvai 16th pAsuram - "nAyaganAi ninRa nandhagOpanudaiya kOyil kAppAnE! thOraNa vAyil kAppAnE!" (நாயகனாய் நின்ற நந்தகோபனுடைய கோயில் காப்பானே! தோரண வாயில் காப்பானே! ), bhagavAn's servitors who protect different areas (main entrance, sannidhi entrance, etc) are identified. sEnai mudhaliyAr - viswaksEnar - the commander-in-chief for bhagavAn's servitors. nambi mUththa pirAn - balarAma is glorified as the elder brother of kaNNan emperumAn and one who always takes care of emperumAn. srI mAlAkArar - As mentioned in srI vishNu purANam as "mAlyOpajIvana:", he is the one who lived his life selling garlands. Translator's note: He gave the best garland with best intentions (without expecting anything in return) to kaNNan emperumAn and pleased emperumAn very much. srI vidhurar - vidhura (the brother of dhrdhrAshtra and pANdu) also known as vidhurAzhwAn is a great devotee of krishNa. Translator's note: He is glorified as "mahA mathi:" (one with great intelligence) when he threw away banana and gave the banana peels to krishNa out of overwhelming emotions. Real intelligence means having great devotion towards bhagavAn. srI nandhagOpar - nandha mahArAja who raised kaNNan emperumAn. Translator's note: He too is glorified greatly in vyAkyAnams for his great attachment towards krishNa. Reciting/using the names of bhagavAn that are not used by our AchAryas is an obstacle. bhagavAn's names such as harIsh, surEsh, narEsh, etc., have come in to existence quite a bit - but such names are not used by our AchAryas and so we too should not be using them. Not reciting/using the names of AchAryas which were used with great joy by our elders is an obstacle. Our pUrvAchAryas glorified true AchAryas using many wonderful titles like "piLLai", "AzhwAn", "ANdAN", "nambi", etc. Such titles/names should be greatly cherished by us. Analysing the EkAnthis (most advanced srIvaishNavas who accept emperumAn as means and goal) based on their native place, family tree and birth is an obstacle. srIvaishNavas should not be judged based on their birth (and many other aspects). It is a great sin. To discriminate them based on their native place or the clan is also equally sinful. In srIvachana bhUshaNam sUthrams 79 and 194 to 200, this principle is explained in detail. Please read the same and have clarity. Translator's note: piLLai lOkAchAryar establishes the glories of srIvaishNavas in srIvachana bhUshaNa dhivya sAsthram. He quashes many misunderstanding and misgivings regarding the position of srIvaishNavas irrespective of their birth by giving many evidences from sAsthram. mAmunigaL, in his beautiful and elaborate vyAkyAnam, highlights many pramANams and explains them in detail, so these principles are understood clearly. For example, sUthram 79 says "EkAnthI vyapadhEshtavya:" - this is a slOkam from vishwaksEna samhithA. In the commentary, mAmunigaL beautifully explains the full slOkam - "One who is fully surrendered to bhagavAn alone is not glorified by his native village, clan, etc., but he is glorified based on his wonderful and eternal relationship with bhagavAn". He goes on to explain that for such bhAgavatha - everything (native village, clan, gOthram, etc) is emperumAn only. In sUthrams 194 to 200 (and few more subsequent sUthrams) - bhAgavatha apachAram is explained in detail. This aspect is discussed in detail at http://ponnadi.blogspot.in/2012/08/srivaishnava-lakshanam-7.html. Starting this point, the words/phrases that are to be used when a srIvaishNava leaves his body (dies) are explained/discussed in detail. This aspect of death is expressed in few different ways. AzhwArs say "paNikaNdAy chAmARE" (பணிகண்டாய் சாமாறே) - chAmARE means "to die". "maraNamAnAl vaikuntham" (மரணமானால் வைகுந்தம்) - when a srIvaishNava dies, he reaches srIvaikuNtam (paramapadham). Nowadays, in srIvaishNava terms, when some one dies, it is indicated as "AchAryan thiruvadi adainthAr" (ஆசார்யன் திருவடி அடைந்தார்). There are different srIvaishNava terms for death that are seen in the pUrvAchArya literature like "thiruvadich chArnthAr" (திருவடிச் சார்ந்தார் - thiruvadi means lotus feet as well as master/lord - thiruvadi chArnthAr means reached the lotus feet or reached emperumAn), "paramapadham eythinAr" (பரமபதம் எய்தினார் - attained paramapadham - the supreme abode), "thirunAdu alankariththAr" (திருநாடு அலங்கரித்தார் - person reaching and decorating the divine land), "avathAram thIrtham prasAdhiththAyiRRu" (அவதாரம் தீர்த்தம் ப்ரஸாதித்தாயிற்று - the avathAram/life/incarnation has come to an end). It is to be understood from this point that based on the type of the srIvaishNava, the appropriate phrase should be used - not doing so is an obstacle. paramapadham and thirunAdu mean the same thing - just the language is different - former is samskritham and the latter is thamizh. Yet, paramapadham (supreme abode) is an ordinary term and thirunAdu (divine land) is a special term. Only AchArya srEshtas are glorified as "thirunAdu alankariththAr" when they leave their body. It is at times difficult to establish how different terms are used for different personalities - that aspect can be learned from elders as required. Translator's note: In anthimOpAya nishtai, following charithram is explained. paravasthu pattarpirAn jIyar says - vaduga nambi was alive for some time after udayavar's ascending to paramapadham. But, eventually he also ascends to paramapadham. One srIvaishNava goes to bhattar and tells him "vaduga nambi ascended to paramapadham". bhattar responds "You should not say like that for vaduga nambi". The srIvaishNava asks "Why not? Cant we say that he ascended to paramapadham?". bhattar beautifully explains that paramapadham is common for prapannas and upAsakas (ones who undergoes bhakthi yOgam and achieves paramapadham by their self effort) - vaduga nambi's focus is not that. Then, the srIvaishNava asks "So, does he have some other place in his mind?" and bhattar explains "Yes. You should say vaduga nambi reached the lotus feet of emperumAnAr" - this is explained by my AchAryan (mAmunigaL). Similar incidents are explained in periyAzhwAr thirumozhi vyAkyAnam for 4.4.7 pAsuram also. Basically it is explained that normally srIvaishNavas leaving this world is indicated by "thiruvadich chArnthAr". If the particular srIvaishNava was very attached to bhAgavatha kainkaryam, it should be said as "thirunAdu alankariththAr". If the srIvaishNava was very attached to AchArya kainkaryam, it should be said as "AchAryan thiruvadi adainthAr". Speaking in a manner that hurts srIvaishNavas is an obstacle. Translator's note: One must always try to speak nicely. It is said in sAsthram that "sathyam brUyath priyam brUyAth" even when speaking the truth, speak pleasantly in a way that is acceptable for the other person who is at the receiving end. Speaking in a manner that rattles the heart of the person who is listening is an obstacle. Translator's note: srI rAma is known as mrudhu pUrvancha bhAshathE" (ம்ருது பூர்வஞ்ச பாஷதே - pUrvA bhAshi) - one who enquires first with kind words when meeting others. Our AchAryas too, always speak in a very pleasant way without hurting others. So, we too can try to follow our AchAryas in this. Not speaking ones own faults, speaking the faults of materialistic people and speaking ones own good qualities (self-glorification) are obstacles. As said in "ahamasmi aparAdhAnAm Alaya:" (அஹமஸ்மி அபராதாநாம் ஆலய:) - I am the abode of all defects, we should see ourselves in a very meek and humble position. nammAzhwAr says "thIvinaiyO perithAl" (தீவினையோ பெரிதால் - my vices are too many). If there are some good qualities, that is upto emperumAn to notice that and acknowledge the same. We need not propagate our own glories. Not speaking the glories of bhagavAn and bhAgavathas is an obstacle. There are no defects in bhagavAn. He is glorified as amalan (blemishless - defectless). bhAgavathas also pure - yet due to the existence in this material world, they may be affected by minor defects. Still we should not focus on such minor defects and we should fully glorify their auspicious qualities. Finding faults in bhAgavathas is a big mistake. Focussing only on bhagavAn's glories and ignoring Acharya's glories is an obstacle. As we have discussed before, bhagavAn is blemishless and pure. bhAgavathas too are called as vEdhakap pon (வேதகப் பொன் - touchstone). By their vision and touch, they purify others. There is an incident related to this (we have already seen this before). A srIvaishNava's son goes astray due to relationship with troublesome friends. The srIvaishNava was pained by his son's situation. But one day, suddenly, the srIvaishNava's son became reformed and was seen with sikhA (tuft), yagyOpavItham, Urdhva puNdram, etc., and offers his respects to his father. The srIvaishNava becomes very happy and at once asks "Did you see kUrathAzhwAn? Did he bless you with his divine vision which purified you?". From this we can understand that he was in firm belief that his son got reformed only due to the mercy of a bhAgavatha. bhAgavathas' glories are greater than bhagavAn's glories. AchArya is the leader amongst bhAgavathas - one should speak highly of ones AchArya. Being knowledgable in deep spiritual matters, one should constantly recite AzhwArs/AchAryas pAsursams/sthOthrams. Not doing so is an obstacle. While reciting the pAsurams, one should also meditate on the divine meanings. This also includes many grathams that are writtten by AchAryas which are to be properly studied and remembered all the time. Reciting manthrams other than guru paramparA manthram and dhvya mahA manthram which are instructed by AchArya and giving up constant japam of such guruparamparA and dhvaya mahA manthram are obstacles. dhvaya mahA manthram is indicative of rahasya thrayam (thirumanthram, dhvayam and charama slOkam). Translator's note: As we understood that our pUrvAchAryas were constantly meditating on dhvaya mahA manthram, we should also understand that dhvya mahA manthram is not recited independently without reciting guru paramparai first, i.e., we dont approach pirAtti and perumAL independently instead we approach them through the guru paramparai. This is why our AchAryas always recited guru paramparA manthram before reciting dhvaya mahA manthram. This is highlighted by piLLai lOkAchAryar in srIvachana bhUshaNam sUthram 274 - japthavyam guru paramparaiyum dhvayamum (ஜப்தவ்யம் குரு பரம்பரையும் த்வயமும்) - One should constantly recite guruparamparai and dhvya mahA manthram.